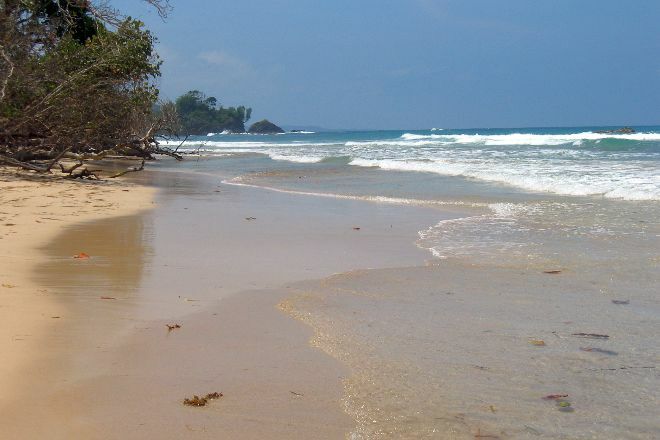 Named after the strawberry-colored poison-dart frogs that inhabit the nearby forest, Red Frog Beach on Panama’s Bastimentos island continues to attract visitors with its idyllic surroundings and laid-back vibe. 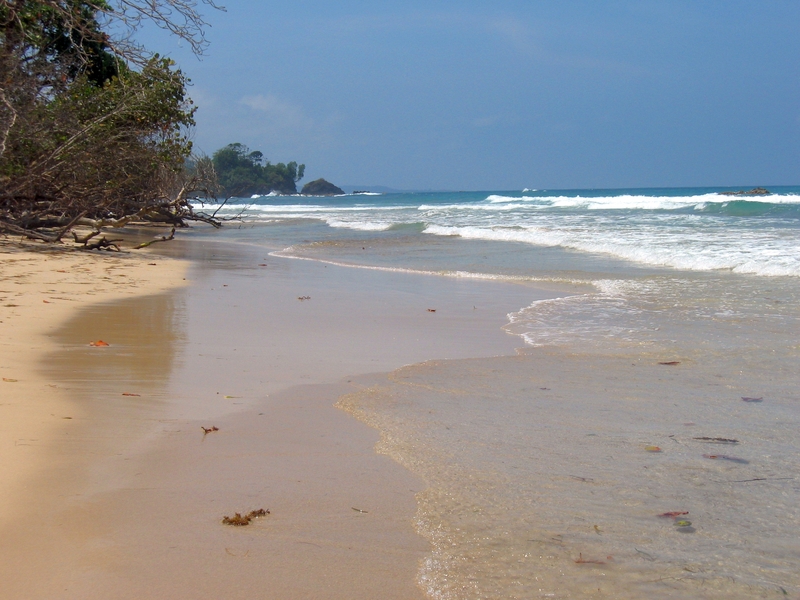 Situated on the northeastern side of the hilly island, the narrow, secluded beach offers plenty of activities. Besides surfing the undulating waves in the swell season, you can swim, snorkel, or laze on the soft white sands. Take a relaxing walk along the sand, surrounded by verdant rainforest, and enjoy the view from the boardwalk pier at the eastern end of the beach. Spot local wildlife, such as frogs, sloths, or monkeys, and hang out at a beach bar with a delicious drink. Our Isla Bastimentos online sightseeing planner makes visiting Red Frog Beach and other Isla Bastimentos attractions simple, and helps you make a travel plan personal to you. Beach on the island of Bastions, pure nature... Little Trail between the woods and there it is... Great waves, giant beach, very beautiful... Thanks a lot for the visit. You can only come here by Water taxi. Price is a Matter for Negotiation. We paid $10 per Person and were picked up after 3 Hours (for me, 2 Hours would have been enough). The Area is in private Hands and therefore you have to pay another 5 Dollars in admission there. Right at the Beginning we could observe a Sloth-just awesome, we were alerted to the Red Frog, which had been hidden in a Tree Crevasse. Then we saw a Caiman (in the small Lake halfway), Herons, beautiful red Dragonflies, Hoouzious Monkeys. You just have to look closely and not just quickly look for the Way to the Beach. The Beach is also very nice-but you have to be careful here because of the Danger of being dragged into the Water. You shouldn't go swimming alone. When we arrived at the Beach, 8-10 People were just running very excitedly along the Beach and a young Girl was just barely rescued from the Danger zone. Every day, we help thousands of travelers plan great vacations. Here are some tips on how to use your Listing Page to attract more travelers to your business - Red Frog Beach. Promote your permanent link - https://www.inspirock.com/panama/isla-bastimentos/red-frog-beach-a2147202235 - on your website, your blog, and social media. When a traveler builds a plan from this page, the itinerary automatically includes Red Frog Beach. This is a great way for travelers looking for a great vacation in your city or country to also experience Red Frog Beach. Promoting your link also lets your audience know that you are featured on a rapidly growing travel site. In addition, the more this page is used, the more we will promote Red Frog Beach to other Inspirock users. For best results, use the customized Trip Planning Widget for Red Frog Beach on your website. It has all the advantages mentioned above, plus users to your site can conveniently access it directly on your site. Visitors to your site will appreciate you offering them help with planning their vacation. Setting this up takes just a few minutes - Click here for instructions.